When's the last time you took a chance on something new? We're all guilty of sticking with what we know. Whether it be ordering the same thing from the menu every time you go out for dinner, or walking the exact same route to the bus stop every day. The familiar is certainly comforting. But what happens when you take a chance on something new? i am used to receiving books which normally include the word ‘visceral’ somewhere amongst the blurb. so it is a little disconcerting to pick up a cover that has a title ‘popping out’ of a party popper with bright stars and streamers. not a drop or pool of blood in sight! i have to admit i am getting a little apprehensive, although not quite on the sweaty palm scale just yet! lucy diamond’s latest, the year of taking chances is not full of bloodshed (although there is plenty of backstabbing!) and i am not the usual demographic for this type of book. however, i always enjoy a challenge and as the book suggests, we should all try something a little different each new year! the book takes in the lives of gemma, caitlin and saffron. i did enjoy my time in the company of these women, although the book does tend to dedicate itself more to gemma and saffron, with caitlin getting less of the limelight than her two new pals. diamond weaves great humour throughout her book and there were one or two laugh-out moments. i adored bunty although she begins as the nightmare client from hell, but evolves in to a solid friend. maybe diamond should think about writing a book called ‘the (mis)adventures of bunty’? i feel the woman is a well of potential material. does ‘bunty’s baps’ merge with hourglass designs? i feel a sequel in the offing! sometimes the humour is a little contrived and some characters i felt were leaning a little towards caricature, especially in the case of gemma’s wayward, wine-swilling mum, karen who years before had run off with a spanish waiter called carlos. this has been done before and could have been more original, but thankfully karen’s appearance is brief. the fortunes of diamond’s main characters are a direct consequence of their meeting at gemma’s new year party. diamond perfectly shows that one should be open to all opportunities and possibilities and nothing should be dismissed from your list until examined with the utmost scrutiny. you never know what you could be turning down. 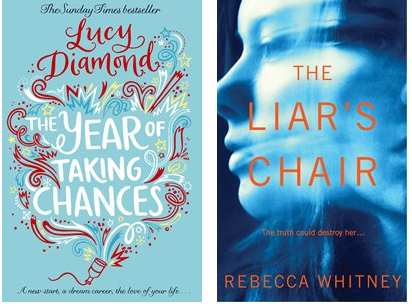 the year of taking chances is a fresh novel that touched on the first four months of a year for three women at different crossroads in their life – who end up taking the same path together. this is a light-hearted read that was involving and funny in turn. definitely a book that will lift those grey winter clouds and make you feel a little more optimistic. the liar’s chair is unlike any book i’ve read before, with no outright likeable characters and no real inkling that any hope could be found at the end of the line. the motives of the protagonist rachel and her controlling husband david felt misguided and sometimes, non-existent, but i have to say, i loved the psychological journey rebecca whitney took us on. this book was unbelievably tense and unpredictable. i’m glad i took a chance on this type of book as it was so gripping and has inspired me to read more psychological thrillers in the future. we’re introduced to rachel at her finest, as on a drunken drive back home to the husband she’s just cheated on, she kills a man in a hit and run. the opening was shocking and really grabbed my attention. the rest of the novel did not go in the direction i was expecting it to, at all, but i found this really compelling to read. the plot progressed at quite a slow pace which really allows for the interesting exploration of the mental state of rachel and she was an impossible character to work out. though rachel was quite prone to making and not dealing with some pretty big mistakes, her husband did not help matters. he was disgusting, cruel and manipulative, to say the least. the descriptions of his psychological abuse really made my skin crawl at times and his vindictive actions were delivered in such a subtle and intelligent matter that i could almost miss them, until i saw the painful impact they were taking on his wife. it was a change to read about characters so detestable but honestly i did enjoy reading the twisted way their minds worked. the liar’s chair provided a fascinating outlook on a marriage so screwed up you wonder how it ever happened in the first place. it will twist and turn and leave you guessing right until the end. sophie hedley reviews at reviewed the book.